Welcome to Green Country. 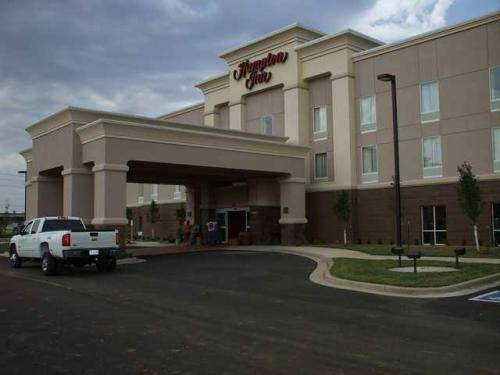 The Hampton Inn Miami Oklahoma hotel is located within Northeast Oklahoma the area we like to call green country. Within the Miami Oklahoma area you will find Historic Route 66 and the Historic Coleman Theatre. The Miami Oklahoma area is home to nine Native American Tribes and several Tribal casinos that bring events to the area such as high profile concerts comedians and sporting matches. When you are looking for outdoor activities near the Hampton Inn Miami Oklahoma hotel you can head to one of the Native American Pow Wows enjoy a round of golf at our two courses and Grand Lake. Miami Oklahoma is situated between the Neosho and Spring River both of which attract fisherman and families for their water activities. So come stay with us at the Hampton Inn Miami Oklahoma hotel and explore the areas of Miami Oklahoma. We love having you here at the Hampton Inn Miami Oklahoma hotel. Coleman House is a American style restaurant located within the Buffalo Run Casino. Clubhouse Restaurant is a American style restaurant located within the Stables Casino. Hadley*s Route 66 Cafe offers sandwiches and salads. Waylan*s Ku Ku Burger is a Historic Burger restaurant located on Route 66. Montana Mike*s is a steakhouse. Charlie*s Chicken - BBQ offers broasted chicken and barbeque items. Pizza Hut is a national franchise offering pizza. El Charro*s offers Mexican cuisine. Hong Kong Garden offers Chinese cuisine. Braum*s offers burgers sandwiches and ice cream items. Honoring the local winner of an over-the-top coast-to-coast race, on foot, in 1928.